"Raphael is known to be the angel of science and knowledge. He is charged with healing mankind and the earth. He holds the title of the Angel of Healing." To learn more about Raphael and others visit the Archangels section! My name is Kimba and thank you for visiting Kimba's Angels. I want this website to be a safe place for people to come and experience angels; to take away from it what is true to them - discard what is not, but most of all feel comfortable and loved. I do hope that everyone is well. As you can see I have had to post several notices on both my Interpretations and Research pages. Our family is currently in a transition phase, because of this most of my personal research library will be unavailable for some time. As things progress I will keep everyone posted! Thank you for both your patience and support; they are truly appreciated! Orifiel: an angel who deals with responsibility and change. With heartfelt apologies I am unable to do Interpretations at this time. Please accept my most heartfelt apologies. *Proceeds from Donations, Amazon.com, and Angel Blessings (Interpretations) help to produce this website. Thank you. Looking for an angel name can be a difficult task when you do not know where to begin. First, take a deep breath! It is not as overwhelming as it seems. Really. There are many different variations of the name (spelling) and this can cause confusion. The best place to look is in any book with "Dictionary" or "Encyclopedia" in its title. Why? Because the names are listed alphabetically; this makes it easy for you to find the name you are looking for as well as those slight differences. "BEAUTIFUL page!! I'm currently in the middle of an intensive study of theology and universal spirituality (and the connection of the two) and have really enjoyed your page! It's the only place I found the answer I've been looking for as far as Raziel being a throne. Once again, great site!! Loved it!!" 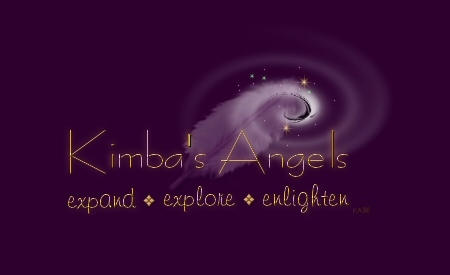 Be sure to Bookmark this website and Share Kimba's Angels with all of your friends and family! Taking the time to learn all that you can. To further your knowledge in Light, Love, Peace, and Harmony. Never selling yourself short, always keeping your eyes open. Experiencing all that life has to offer. Living in Light and Love, uplifting your spirit. Raising yourself to a higher consciousness..."
To read this entire article, please visit the Angelic Lightwork section! In this time please help to keep Kimba's Angels...alive and free.